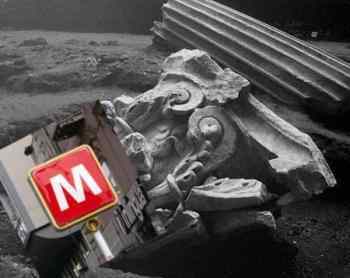 The somewhat less than irresistible force of underground train construction in Naples has once again run into the immovable (but not indestructible) object of an ancient Roman archaeological site. So far it’s a tie, but I suspect than when the dust has cleared, the new Duomo metro station at Piazza Nicola Amore will incorporate (as the metro has done elsewhere) at least part of the old ruins, in this case, the monument complex of the Isolympic Augustan Roman Italic Games. Construction now seems to have picked up again, and a lot of archaeological pieces have been moved to the small metro-museum beneath the main National Archaeological Museum. Historian Strabo mentions the games of Neapolis and says that they "rivaled the most famous games of Greece." The recent excavations have uncovered parts of the portico and temple associated with the games, which were started by Augustus Caesar in 2 AD. Those structures were found on top of earlier ones put up in the second century BC as part of a general renovation of the stretch of beach before the old southern wall of Greco-Roman Naples. The prefix iso- means “same as” and thus proclaims the importance of the games by declaring them equal to those of the Greeks. Indeed, archaeologists have actually found the inscription, "We are the Roman Augustan games equal to the [games] in Olympia." The inscription was one of 400 pieces of Greek-inscribed marble recovered from in front of the temple of Augustus. Augustus chose the very Hellenic town of Neapolis for the games. They were held every four years and featured equestrian, athletic, and musical contests. The equestrian contests included horseback races, and races of chariots drawn by teams of two and four horses. The athletic contests included stadium races, pentathlon, wrestling, boxing, pancratium (mixed—anything goes—combat), an armed race (I’m afraid to ask! ), and acrobatics. The athletes, who came from all over the Mediterranean, competed in their age groups. Women also took part in the contests. The winners in the athletic contests received a wheat-stalk wreath, but there were also prizes in money for the musical and theater contests, which included flute, kithara (or ‘cithara,’ a seven-stringed lyre; the name is the origin of the word ‘guitar’), poetry, comedy, tragedy, and pantomime. 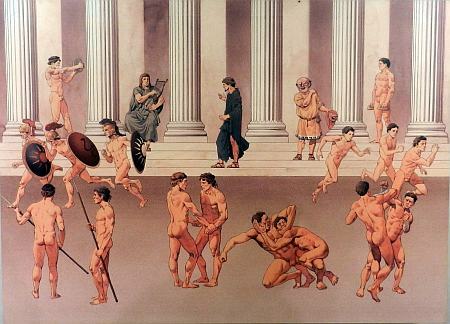 The Isolympic games were still being celebrated in the second half of the third century AD, when the temple and the portico were renovated for the last time. There are three slabs on display in the museum (photo, above) and date from the late first century AD and bear lists of winners of several editions of the games. The winners came from Asia Minor and Egypt. The only Neapolitan winner may have been one Julius Valerianus —“from Neapolis” (although other towns named Neapolis existed in the Greek and Roman world). On the first slab, one can still read the year in which the games were held (94 AD) and the names of the agonothetai (the presidents and organizers of the games). The second slab lists winners of athletic games. The program includes, as well, a female contest. On the third slab, the name of the reigning emperor (Domitian?) stands out in a list of authors of eulogies to Augustus and his successors.